Fighting Irish Thomas: Saving Notre Dame: Mary Ann Glendon, Our Lady's "Secret Weapon?" Saving Notre Dame: Mary Ann Glendon, Our Lady's "Secret Weapon?" "So do you think this is the photo Nancy Pelosi taped her head over to prove she saw the Pope?" 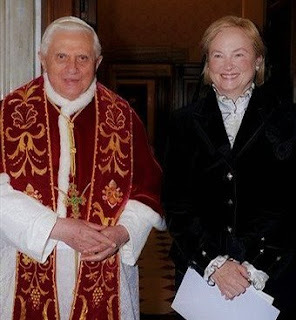 my wife kidded me about this article's picture of Pope Benedict XVI and Mary Ann Glendon, former U.S. Ambassador to the Vatican and current Harvard law professor, not to mention this year's recipient of the University of Notre Dame's Laetare Medal, ND's highest award for Catholics. While her picture with the Pope is proof that Professor Glendon, dubbed "the pro-life feminist" by the secular press, was, unlike Pelosi (whom His Holiness resolutely refused to grant even the briefest photo-op to, lest it be construed as acceptance of the speaker's heretical Catholic stances and thus lead to scandal), in good standing with the Holy See, does that mean she will stand up for the Faith when she takes the stage almost immediately before Obama during next month's controversial commencement at Notre Dame? With the President's acceptance of Fr. Jenkins' disobedient (and disgusting) Notre Dame commencement invitation, Glendon's appearance has been completely overshadowed, and her speech and award (which is actually more prestigious than Obama's honorary law degree), an afterthought. Despite her impressive credentials (former President of the Pontifical Academy of Science, member of the President's Council of Bioethics, as well as distinguished author, professor and ambassador), Jenkins and his henchmen no doubt consider her no more than a warm-up act, a local folk singer compared to Obama, the rock star leader of the free world. Yet, sometimes, in rare but pivotal moments in history, "when the players tried to take the field, the marching band refused to yield ..."
Professor, what if you were to incorporate some of Mother Teresa's speech into your Laetare acceptance talk? How better to "dialogue" (Jenkins' own word) Obama, than with Mother Teresa's gold standard (or shall we say "God standard") pro-life speech, at the "flagship" of Catholic universities? 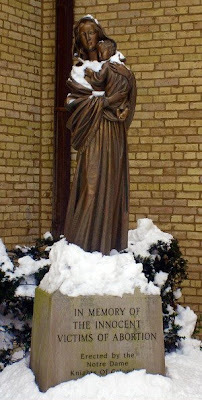 With a glance toward Jenkins, you could start with Mother's stark, "The greatest destroyer of peace today is abortion, because it is a war against children, a direct killing of an innocent child, a murder by the mother herself." Then, with a nod to Obama, you could continue with the future saint's assessment, "Any country that accepts abortion is not teaching its people to love, but to use violence to get what they want." Looking to the students, you could then explain Teresa's treatise that contraception "destroys the power of giving life" and "turns attention away from each other and to self," where, with the addition of abortion, it teaches man "he does not have to take responsibility," and woman "to kill her own child to solve a problem" leading to the "destruction of their love for each other." Then after echoing Mother's plea, "Please don't kill this child! I want this child!" you could conclude with an Irish paraphrase of her battle cry, "Let Notre Dame be a sign of care for the weakest of the weak—the unborn child—to the world! If you let Notre Dame—and America—become a burning light of justice and peace in the world ... [through them] then you will really be true to what the founders of this country—and university—stood for!" Now you couldn't really get in trouble for giving that speech, could you, Mary Ann? After all, you are not addressing this dueling, fooling presidential duo with the Glendon agenda, but merely quoting the words of a former Nobel Prize winner, a proper prophet club of which even the great global warmer himself, Albert Gore, is a member. Of course, your presents to Obama (a picturesque plaque for Sasha and Malia's playroom bearing the Mother Teresa saying, "It is a poverty to decide that a child must die so that you may live as you wish," plus for his office, a framed picture of the White House with an aborted live baby at the door, bearing the caption, "There's someone here to see you, Mr. President,") and Jenkins' (an autographed—by each and every bishop!—copy of their 2004 United States Conference of Catholic Bishops statement, Catholics in Political Life, which ruled against Catholic universities extending invitations or granting honors to pro-choice politicians, plus a photo of you shaking hands with Bishop D'Arcy in front of Notre Dame's "Our Lady of the Unborn" statue, in which the Bishop writes on back, "Sorry I couldn't be there today/Your favorite bishop/John D'Arcy/P.S. You're laicized! Turn in your vestments!") might be another story. Most likely, Notre Dame would ban you forever (or at least until the faculty returns to Our Lady) and Harvard could give you the heave ho. But think of this, Ms. Glendon. Like the martyrs, you'll go out in a blaze of glory, and more importantly, you will be the answer to all of our Notre Dame commencement prayers. For you will prove that, despite Obama's insolence and Jenkins' infidelity, "Truth is great and it will prevail."